I just found this gem on my friend Ashlee's blog. Its a recent post by Orson Scott Card in the Mormon Times... every single girls frustrations laid out from a guys point of view and the kicker....how guys need to fix this issue! "I have come to a new theory, which is...time hates some people (me). I dont know what I have done to piss time(ing) off but I would really like to make up. Seriously, time, I am sorry. 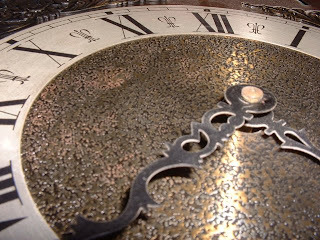 Time has been playing favorites for awhile now. I must admit I get a little resentful when married-dating-happy people say things like it just wasnt the right time. Your time hasnt come. You will know when its the right time. etc etc. They only say such things because time loves them, but time hates me." There are places in the world I love and Moorea, French Polynesia is one of them. I’ve been very lucky to be able to go there many times in the last 10 years and each time I love it even more. I was just there a few days ago and was reminded of one of the first amazing experiences I had there. It was one of the first times I knew I LOVED that place! It was 9 or 10 years ago and I was on Moorea for an Outrigger event (one of the groups I take down there each November). At that time on Sunday mornings we would try to let all of our attendees go to church so one of the events staff (me on this particular day) would end up spending all morning driving people to beautiful little churches around the island and then all afternoon picking everyone up. We would drop people off at about three or four different churches all over the small island. This Sunday morning I had just finished dropping off the last church goer at a beautiful little catholic chapel and was headed back to the hotel. As I drove on this beautiful little road through the tree covered streets it began to rain. It was a soft tropical rain with lots of sunshine still streaming through the canopy of trees along with the raindrops. The combination made it look like tiny little diamonds falling from the sky. It smelled like heaven and the temperature was perfect. Those few minutes driving along, alone, in that little car, on the island of Moorea were a quite form of bliss. The warmth, the light, the color, the breeze… everything just came together and sang to me. That day I didn’t feel bad that I didn’t get to go to church. I was in church as I drove down that road. Amazing creation! I had a minor “glimpse” of that when I was just in Moorea as we drove down a different part of that same road. The trees covered the road again and the rain and sun were peaking through in patches. It wasn’t quite as serene, but I remembered that day from so long ago so vividly that I had to write about it. On a side note… well, a few side notes :-). I also am in awe whenever I see sunshine coming through the clouds after a storm or during a sunset. You know when you can see individual rays streaking out across the sky stretching across the horizon or beaming down on a particular stretch of earth. I think it is one of the most amazing things to see. It always stops me short. I think it makes the sun’s rays look almost tangible, like if I really tried and got close enough I could hold that warmth and light right in my hand as it beams out through the fluffy clouds. 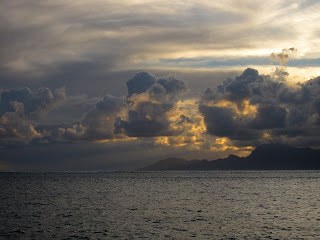 Another thing I did when I was on Moorea one afternoon was watch shapes appear in the clouds. I love doing that… why do we forget to do those simple things that fill our hearts with such joy and beauty? I’m trying to make a mental note to notice stuff like that more often because when I do it’s a lot easier to remember how many wonderful things I have in my life. My heart saves these moments !